This article was contributed by Carolyn Mescher, CPA. Tax season is just around the corner, and digging through your files and records can be quite tedious. But it’s nevertheless important. Carolyn provides us with six great tips related to business expenses. As the disclaimer at the end states, it’s important to seek professional advice. I know that we have readers from all over the world, which means the rules and laws in your locality could be different. Make sure to do your homework. With that out of the way, here’s Carolyn! 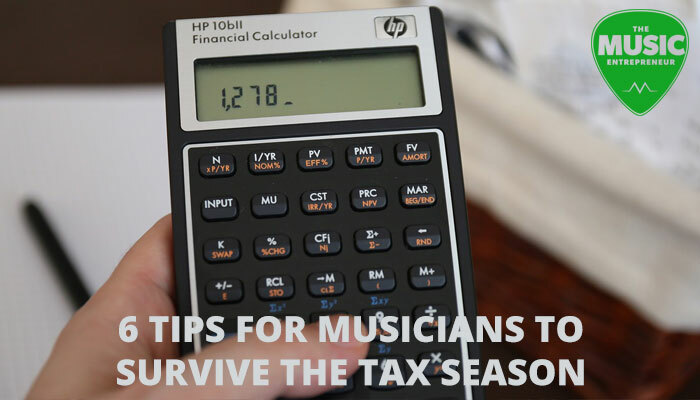 What every musician, artist, songwriter, and music professional should know about filing your 2015 taxes! While preparing taxes, I have come across far too many musicians, artists, songwriters, sound techs, managers, etc. who overpay the IRS because they filed online. They ended up missing thousands of dollars of deductions, and still had to pay for online tax filing. Please let me help you save a few hundred or even a thousand dollars! Before you overpay the IRS again, prepare with these six deductions most often missed by musicians. Get your touring schedule/calendar. If you don’t already have a calendar that shows which cities you visited and “on the road” days while touring, make it based on your records. There are specific meal allowances for each city you stay in (if you were allotted a per diem, compile these amounts as well, as they must reduce the amount of meal allowances you’re allowed to deduct). Many self-employed and work-from-home people use their cell phone and internet to book gigs, market, and work, so these are considered necessary business expenses. Determine how many business miles you drove in 2015. If you didn’t keep a record, refer to your touring calendar and find the driving distances to and from cities. The 2015 mileage deduction is $0.575/mile! Membership fees for NSAI, professional musician associations, subscriptions to professional magazines – such as Songwriter, Recording, MusicRow, or other professional publications can be deducted. Did you purchase any new equipment, instrument, strings, picks and so on for your music activities last year? Did you pay any photographers, musicians, producers, etc. for their services? Compile receipts, and check images or charges, as these fees can add up quickly and make for significant deductions. Do you use a room in your house as a studio? You can deduct utilities and rent proportionate to the square footage used in your studio divided by your total home. Use the MileIQ app to track business vs. personal miles driven. Have your oil changed at the beginning of 2016 and again at the end of 2016/beginning of 2017, so you have a record of how many miles you’ve driven during the year. When you go to a show, buy new music, or meet a business contact for coffee, a drink, or a meal, get a receipt and note who you were with and what you discussed on the receipt. Keep your business receipts! I recommend just keeping a big envelope and putting all business receipts in there throughout the year. After each month, print out your bank and credit card statements and highlight business expenses, making written notes where needed. The information contained within this article is provided for informational purposes only and is not intended to substitute for obtaining accounting, tax, or financial advice from a professional tax preparer or certified public accountant. Presentation of the information is not intended to create, and receipt does not constitute, a tax planner-client or financial-planner-client relationship. Internet subscribers, users and online readers are advised not to act upon this information without seeking the service of a professional tax preparer or certified public accountant. Carolyn Mescher is an entertainment CPA out of Nashville, TN, who specializes in music accounting and taxes. Being an artist and songwriter herself, Carolyn is intimately familiar with the creative side of the music industry, as well as the business side. She is currently writing a tax book, specifically for musicians which will be available in the first quarter of 2016.